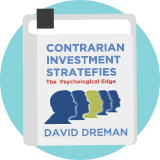 David Dreman Low Price to Cashflow is a contrarian value strategy developed by the famous US investment manager and author David Dreman in his book Contrarian Investment Strategies. It uses a basic value filter of selecting the cheapest 40% of the market by Price to Cashflow ratio and filtering further for quality according to company size, financial strength and growth. Dreman favours cash flow over earnings: "If we take two companies with similar outlooks, markets, products, and management talent, the one with the higher cashflow will usually be the more rewarding stock. In investing, as in your personal finances, cash is king." Dreman's studies showed that the cheapest 20% of the market by P/CF outperformed the most expensive 20% by 6.8% annually. Dreman cautions towards a buy and hold approach because "transaction costs are often not recognized by investors, but can be very expensive". Dreman is currently the founder, chairman and CIO of Dreman Value Management LLC. Author of 'Contrarian Investment Strategies: The Next Generation'. Regular columnist for Forbes magazine. The 'contrarian guru' of investment shows today's financiers how to out perform professional money managers and profit from Wall Street panics.